Connects to virtually any system (PBX). 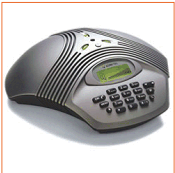 Connects to PC via soundcard for IP telephony. Connects to GSM & DECT telephone (Accessory). Connects to analogue line ( PSTN ) or analogue extension. ( PSTN ) or analogue extension. Numerical keypad & Graphic Display. Phone book for 50 Contacts. Connects to ISDN / S0 line ( PSTN ) or analogue extension. Numerical keypad & Large Graphic Display. LCD Backlit display Icluding Number Dialed & call date. Connects to all devices Mobile or DECT Telephones. Range of up to 30m. Incorporates easy to use feature. 1.5 and 2.5 metres, included. The remote control allows you to control all the functions on your Konftel 200. It has four programmable speed dial buttons. Range: 5 m (16 ft) Batteries type 4xR03 included.